One of my daughters let me know that the water bowl in the sun room was no longer on its heater, so when I had a moment, I went out with a pitcher of fresh warm water, heading through the Old Kitchen to fix it. On opening the inner door, I noticed the food bowl in the sun room was empty, so I paused to grab some kibble to top it up. Of course, as soon as I opened the door, there was a flurry of cats running out of the sun room, while others were running towards the Old Kitchen door. I saw Ferdinand run out, and then Slick headed for the door. 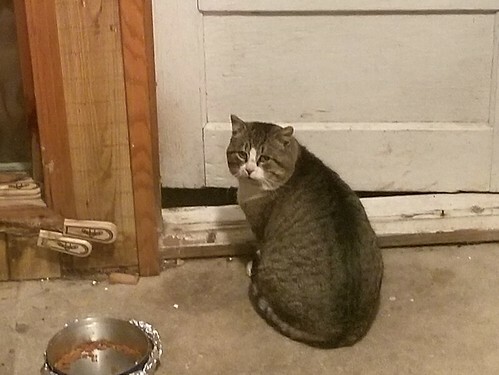 Thanks to Ferdinand staying in the doorway, preventing the other cat from getting out, I was able to grab a few quick pictures. I had to show it to my daughters to confirm. What I did not see until my daughter pointed it out to me, not only is Ferdinand in the doorway, but Nicky the Nose is outside, looking through the window. The new cat finally ran past Ferdinand when I opened the door. I never saw Nicky the Nose at all, but Ferdinand did not run off like he usually does. 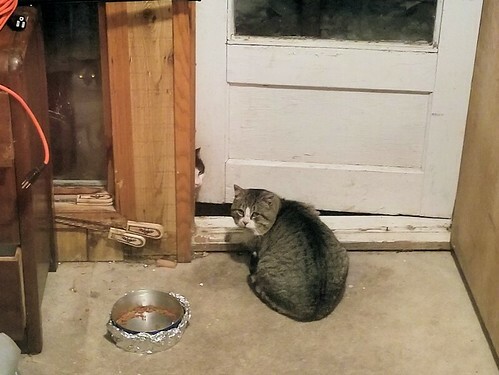 He actually hung around, watching me from just a few feet away, as I knocked the ice out of the outside water bowl and refilled it, as well as topping up one of the outside food bowls. The water bowl was indeed knocked off the concrete block, but there was no spill. It was completely dry! With the outside bowl frozen over, they were very happy to have fresh water. He has the saddest expression on his face! My older daughter had been seeing a strange cat that was more grey than Slick, off and on, but this is the first time I’ve finally seen him. So he’s actually been around for a little while. This brings us to 14 outside cats in total. The 6 kittens. Beep Beep, Butterscotch, Rolando Moon and The Hand are all cats we were feeding when we first moved out here. Slick, Nicky the Nose, Ferdinand, and now this guy. That’s basically twice as many as we were regularly feeding last winter.